One moment you're sitting atop a snow-capped mountain, the next you're photographing breaching humpback whales or swimming with penguins... What one of South America's smallest countries lacks in size it certainly makes up for in variety. Travellers to Quito and the Galápagos Islands can admire colonial-era buildings in Quito, hike along volcanoes in Cotopaxi Park or visit the otherworldly Galápagos islands. Footprintfocus Quito & Galápagos Islands offers vital advice on how to navigate your way round these fascinating destinations as well as providing all the necessary information on where to eat, sleep, drink and party. • Essentials section with useful advice on getting there and around. • Highlights map of Quito so you know what not to miss. • Comprehensive, up-to-date listings of where to eat, sleep and have fun. 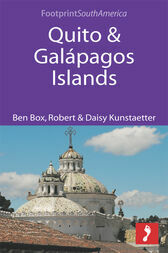 • Detailed street maps for Quito and advice on choosing a tour for the Galápagos Islands. Loaded with advice and information, this concise Footprintfocus guide will help you get the most out of Quito and the Galápagos Islands. The content of Footprintfocus Quito & Galápagos Islands guide has been extracted from Footprint’s Peru, Bolivia & Ecuador Handbook and Footprint’s South American Handbook.